There’s surely no better way to kick things off than with a true London classic, the Brindisa chorizo roll. PRICE: £4.95 for two pieces of chorizo, £3.95 for one. Obviously I had the former. BREAD: Ciabatta roll drizzled with olive oil and grilled. FILLING: Chorizo, Piquillo pepper, rocket. 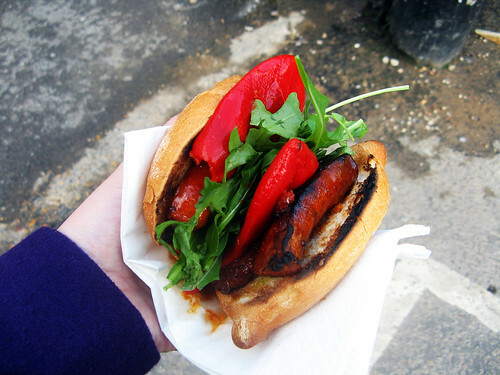 PROS: This sandwich is truly deserving of its place as a London stalwart (they’ve been firing up that grill for over 10 years now) and its success is down to the quality of the ingredients and the fact that the chorizo is grilled to order. A generous portion of freshly sizzled picante sausage (imported from Spain by Brindisa) oozes scarlet-paprika oil onto the scorched ciabatta bun. It really is some of the best Spanish sausage in London. Piquillo peppers serve to further ramp up the intensity with some sweetness. As for the rocket, this sandwich has the flavours to give it what for and quash any bullying tendencies. CONS: Borough Market is a tourist destination and you’ll need to get there early unless you don’t mind queuing and spending 30 minutes trying to walk 10 yards in pigeon steps.